Madrid: Barcelona won their second Clasico in four days on Saturday and Real Madrid might have to win the Champions League if Santiago Solari is to be in charge for the next one. 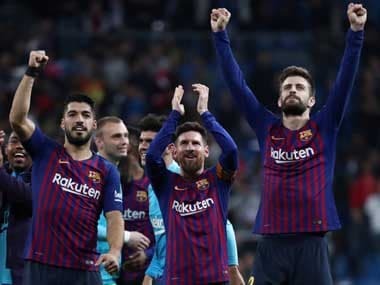 After knocking them out of the Copa del Rey on Wednesday, Barca returned to the Santiago Bernabeu for a 1-0 victory that surely eliminates their greatest rivals from the title race too. Lionel Messi and Sergio Ramos locked heads after Ramos flung an arm into Messi's face but, despite the scoreline and a few half-chances, that was about the most trouble Madrid caused. Messi would have been proud of Ivan Rakitic's delightful chip, a rare moment of precision that in the end settled another Clasico high on vigour but lacking in either real quality or rhythm. "What we wanted was to deliver our best and to inflict damage on our rival. We have done that," Barca coach Ernesto Valverde said. The onus was on Madrid, not only to make amends for their defeat in midweek but to reduce the nine-point gap between them and La Liga's leaders. 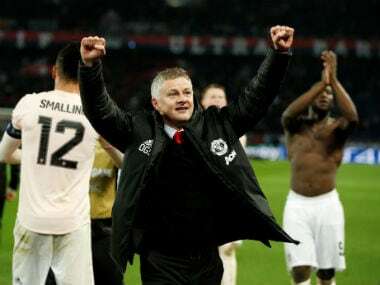 Instead, Barcelona extended it to 12 and the way their players jumped up and down in front of the away fans after the final whistle suggested they felt this was a major hurdle overcome. Barcelona also now own 96 victories in this fixture to Real Madrid's 95, the first time they have been in front in 87 years. When Solari took over in November, his team were seven points adrift of the Catalans and the fact the deficit has almost doubled since might not reflect the improvement in performances. But this was the first time Madrid have lost three in a row at home in 15 years and these are surely the matches president Florentino Perez will remember when he considers his coach's future next summer. "You go through spells, sometimes everything goes for you and sometimes it doesn't. In these two games it hasn't," said Solari. All that realistically remains now is the Champions League, in which Madrid will carry a 2-1 lead into Tuesday's second leg at home to Ajax. Europe has rescued them before and it also revived Gareth Bale, who endured another frustrating night on only his third start in 10 games. Bale was largely anonymous again and when substituted in the second half, he departed not just to a scattering of whistles from the home crowd but a chorus. "He tried, like the rest of the players," said Solari. It took Busquets 89 seconds to be booked and only a few more for Bale to send the free-kick over the bar but Madrid started with purpose, like a team determined to right the wrongs of before. Their early impetus faded though as Barca, driven on by Messi, took control. 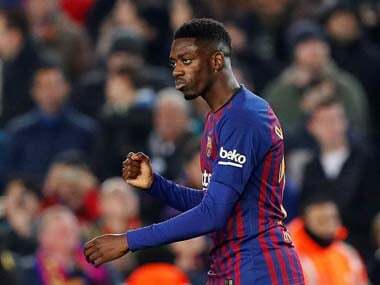 Messi skipped through three players in midfield and was furious with Ousmane Dembele when he missed his late run into the box. He then weaved in behind with the help of a Luis Suarez touch but, to everyone's surprise, the trademark lifted finish floated wide. Rakitic showed him how to do it. 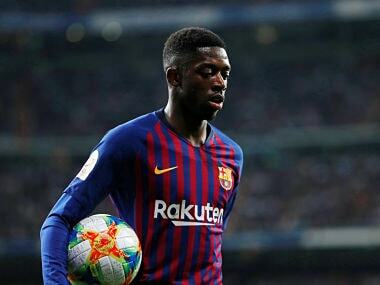 He played the ball wide to Sergi Roberto, continued his run behind Ramos and received it back, before feathering a delightful chip over Thibaut Courtois. Barca were comfortable but the game erupted on the stroke of half-time. Ramos won the ball from Messi but, with his arm outstretched, left it long enough to catch his opponent in the face. Messi pointed to his lip and then butted heads with Ramos but referee Alberto Mallenco saw nothing worthy of punishment. Madrid pushed for an equaliser but their desperation showed. Benzema failed to connect while Vinicius Juniors' rushed shot was blocked. Bale was hauled off just after the hour, replaced by Marco Asensio, and even Isco came on in the 76th minute, for his longest appearance since the end of January. Raphael Varane might have snatched a late equaliser but his header was weak. Barcelona were left celebrating again.